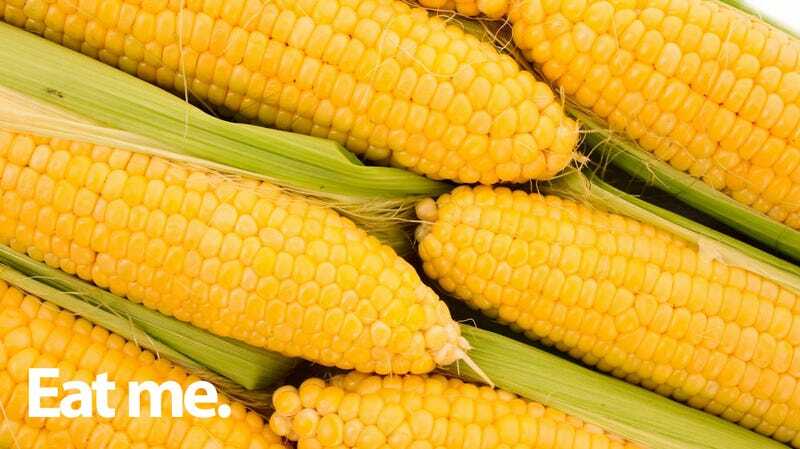 Monsanto, the oft-vilified company known for hawking genetically modified seeds and suing farmers, is putting genetically modified sweet corn on supermarket shelves this fall. Monsanto's corn will look like any regular corn on the shelf, but it will be genetically altered to carry Bt toxin, which messes with insect's digestive systems and kills them, allowing farmers to forego pesticides. Are you afraid of eating genetically modified food? Should you be? Maybe, but chances are you already eat it. This isn't a first: Syngenta, a Monsanto rival, has been selling genetically modified sweet corn for 10 years, and Seminis, which Monsanto acquired in 2005, sells genetically modified squash. Plus, most soy, a common ingredient in processed foods, is genetically modified. Didn't know you were possibly shoving those genetically modified crops in your mouth? That's because labeling genetically modified foods isn't required in the United States like it is in Europe and Japan. The industry learned its lesson in the early '90s when Calgene labeled their Flavr Savr tomatoes as genetically modified and hardly anyone bought them. The science on whether the Bt toxin trait in food is dangerous to humans who eat it is still pretty unclear. A recent study found the toxin in the maternal and fetal blood of pregnant women, although it's still not certain that poses any threat. Opponents say GMOs might cause allergies and cite the fact that many weeds have become resistant to the crops. Until now, Monsanto products have been mostly found in animal feed and processed foods. So consumers weren't grabbing whole Monsanto-made fruits and veggies off supermarket shelves (except for that squash). But with that about to change, the assumption is that consumers will be ingesting more and purer genetically modified ingredients - whether it's Bt toxin or something else - than they would in processed foods. Monsanto, DuPont and other companies that sell genetically modified foods maintain that their products are "nutritionally identical" to regular food. They even argue it's healthier because GMOs don't require pesticides to grow. The U.S. Government so far agrees. Monsanto probably won't flood supermarket shelves with other genetically modified veggies, even if their corn is a success. Groups like GMWatch who lobby heavily for labeling aren't going anywhere, so Monsanto, et al, will likely tread cautiously. Meanwhile, if you want to avoid eating anything genetically modified, your best bet is to shell out at Whole Foods or another outlet that certifies groceries using the Non-GMO Project's 99.1 percent GMO-free standards.